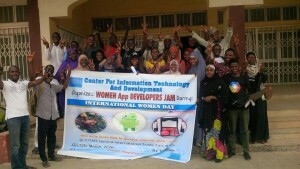 On Saturday, 14th March, CITAD as part of its celebration of the International Women’s Day held a one-day training for girls on mobile apps development. 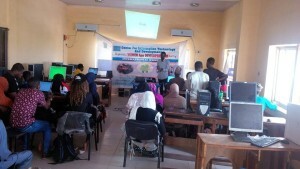 The event, code named Women App Developers Jam held at the main training lab of CITAD and was attended by 34 girls from Bayero University, Kano and other nearly institutions. As one of the leading organizations advocating for digital inclusion, we intended to bring more women into mobile apps development as their representation in ICT is so low that serious intervention is required. The event was thus to introduce them to android architecture and the potential marketplace for their android apps. As a way of exposing them to entrepreneurial component of App development, we gave them entrepreneurial talk during the event and also exposed them to the best way they can monetize their apps using ad mobs and android pay. With this event, we were able to reach out to a reasonable number of female enthusiasts, raised their interest in IT (App development in particular), raised their level from mare technology users to technology inventor, and above all clear away the stereotype that women cannot be technologist /inventors. As an outcome, we were able to develop two Apps in an interactive mentoring style with them. A team of women enthousisast was formed with the aim of creating a forum for mentorship in app development. One major challenge faced was the background of the attendees, many of them were eager to learn, but they had no previous adequate knowledge that could be built on which made the core part of the programme sounded gibberish to them, making some leave before the end of the programme as such, making the programme not as successful as planned. One new thing that served as a lesson after the event was that it would always be a good idea to first sample the participants knowing their background in programming before actually going into it, so as to enable facilitators come lower to their understanding. The two android apps developed during this event would be made available to the participants so that those interested could build on them and improve on them. 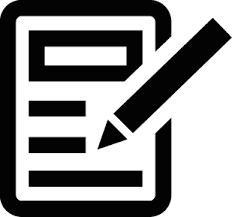 We also intend to create a forum where participants could ask questions in order to solve problems they encountered during practice. In addition, CITAD is planning to have a more women centered apps development event series in order to further enlighten those interested in apps development.